Cooking for both amateurs and skilled chefs have more than just putting food in the microwave. Approaching the kitchen world, you should see countless items to memorize. Roasting, baking, stewing or even cutting are definitely not as easy as pie. Sometimes, even an international famous gourmet would not leave his cooking territory empty without sheets of recipes and guidelines. There would be a time you could remind yourself of measuring only 100 grams of sugar, but your mind went absent when adding salt. Or you can write down the instructions and use them once before you throw them all to the trash bin with all the food waste. Those things are pretty common in the kitchen. So, you need a better solution. Once and for all. The problem urged us to create an ultimate kitchen cheat sheet to ease everything. There will be no more confusing in British measurements, meat cuts, or timetable for each ingredient. Everything will be clear in front of your eyes for no more looking hassle. 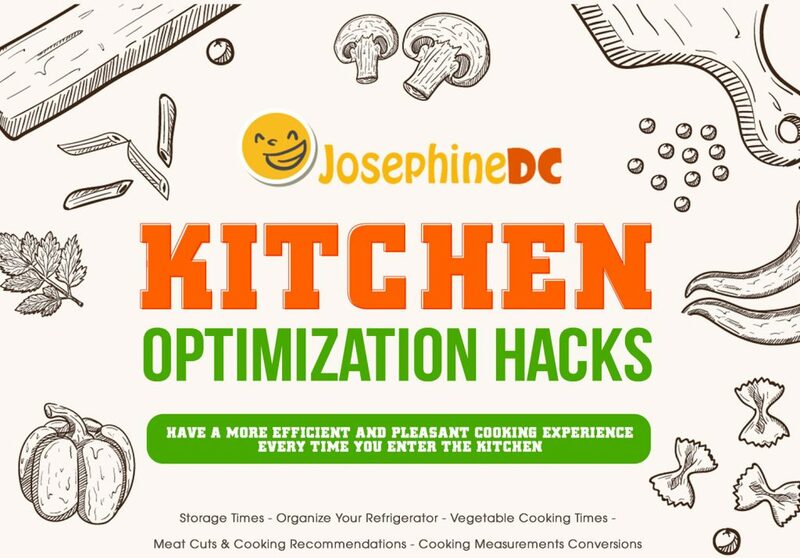 At Josephine DC, HELEN J.CERVANTES and MARY J.LYNCH introduce five printable infographics to help you gain your culinary prowess in establishing the most accessible kitchen ever. Save the picture in your tablet or smart devices where you can easily access. Cooking has never been more enjoyable. These sheets distributed by our authors HELEN J.CERVANTES and MARY J.LYNCH from JosephineDC are free to download. Don’t just keep the good for yourself, why shouldn’t you share with your loved people? We are sure your mom, grandmother, aunts, or sisters will love it. Food is the source of delicacy so you should never underestimate the quality behind it; even though you have the fridge to keep them fresh. 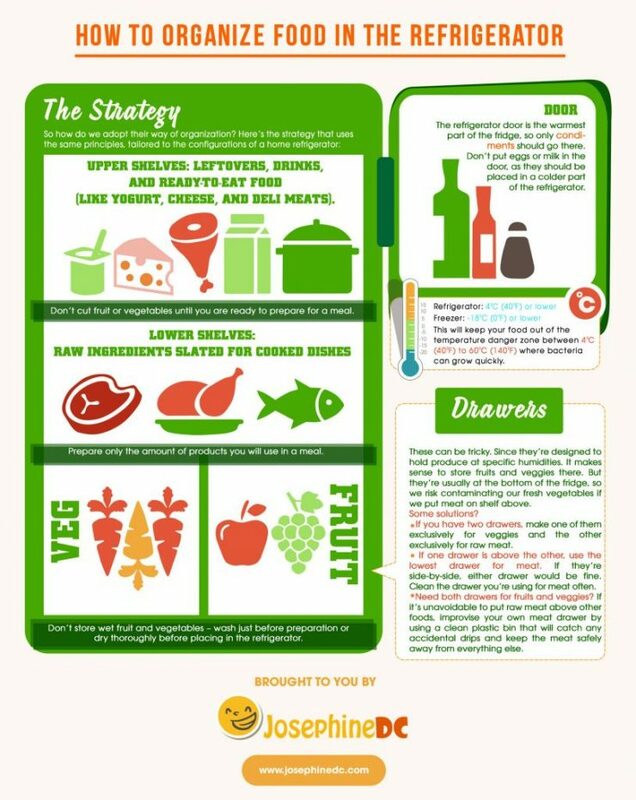 Storing food relies not only on the refrigerator itself. Knowing the fresh period of your ingredients is also the key. For example, raw meat can be stored from 3 to 5 days under 40oF, whereas when they got frozen, low temperature can elongate their shelf lives. Isn’t it awesome if you can store fruits or salad for more days before consumption? To keep them from becoming too soggy, it's better to use them up in 3 to 5 days and don't freeze them. The same applies to opened canned food. In frozen condition, bacon can last 1 month. If you leave them in the cooler, make sure you don't eat them after 7 days. In the same categories, sausage can only stand 1 to 2 days. If you don't eat them the next day, it's best to move them to the freezer. With cooked food like stews and soups, the storage times don't last more than 4 days. Your leftover should not be left in the freezer for more than 3 months. Pizza can only stay iced in maximum 2 months. Most surprisingly, there are types of food you can keep for a whole year without any harm to its nutritious levels like fresh poultry in the frozen condition. But if you have chopped them in pieces, mark the date and use them before 9 months. How long do you think hamburger can stand in a cool climate? Only 1 to 2 days. Make sure you consume them before the expired time. The shelves in the fridge are not impromptu designs. They are made for specific ingredients. But the manufacturer manual wouldn’t map out where you should put your fruits or milk. This little kitchen cheat sheet for refrigerator organization will be happily stuck on your cooling machine to point out the organizing tactics. The optimal temperature for the freezer is 0oF or lower to keep your food hibernated as long as its suggested period. While in the fridge, it should set as cool as 40oF. Higher temp range will create an ideal environment for bacteria to grow. If you once thought the drawers could hold the same thing as the other shelves, you would find that it’s a wrong assumption. Drawers tend to be more humid than the outside make them ideal for fruits and vegetable. What to do when you have a refrigerator with two drawers? Make the top one the realm for veggies, the lower one you can use it for meat. When storing vegetables and fruits, wash and rinse them thoroughly before storing them. Don’t preserve any veggie before you draw them out for cooking. If you do, only utilize the portion nee for the dish. But is it ok if you put meat on the shelf above the drawers? Yes, if you can clean the meat container regularly and isolate them completely from other goods. In the door part, where it is the warmest, only leave condiments there. A mistake people usually make is putting milk and eggs here. Stop this habit now because milk once opened should only be kept in a cooler temp range. Fresh and frozen veggies count different clocks to get cooked. To make them perfectly soft inside out, you don’t use your tongue and teeth but a timer. Because the portion and the condition of the items could differ from those in the formula, adding the right water is the key. 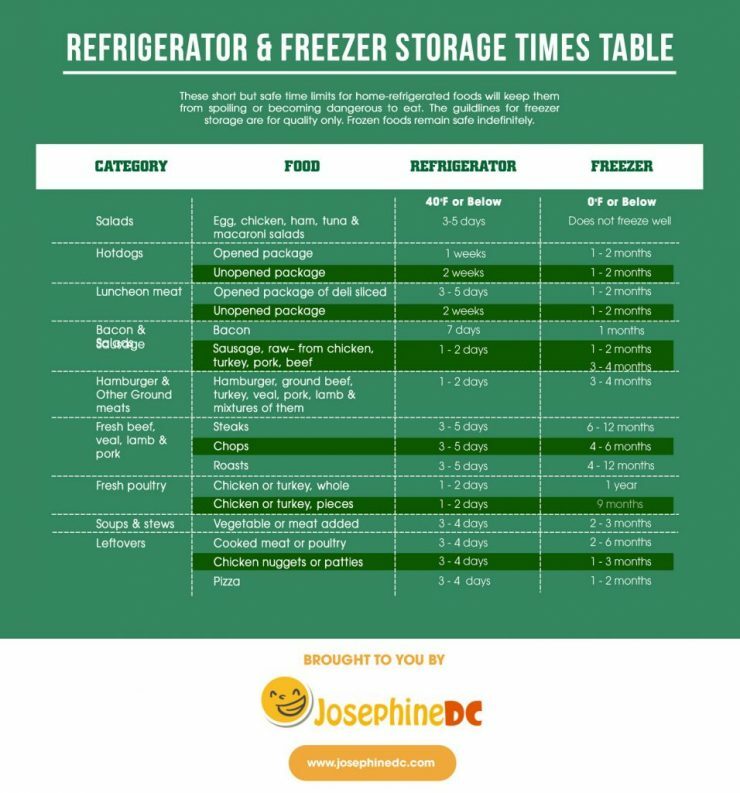 The exact cooking times are indicated in this kitchen cheat sheet of vegetable cooking times. Carrots would take 2 to 3 minutes in boiled water to get soft, but longer if they had been taken out from the freezer. You can cook green beans and onion in the about the same time. Sliced parsnip, peas and escarole take less time to get soften; pay your attention to the pot when boiling them. Vegetable with the firmer structure like tomatoes, chunked turnips and sprout will need one or two more minutes to get cooked. Other veggies from the root family like sweet potatoes, beetroots, and pumpkin require more than 10 minutes to be reserved. With frozen vegs, add one or two more minutes to make sure they got defrosted in the inside. Also, the portion can vary which requires more water. Besides, the time for cooking styles is also set. Whether you want to boil, bake, or roast, you have got all the advice cracked down. For boiling in the saucepan, pour 1 inch of water in, then add the veggies, cook them in the indicated time. Steaming uses less than haft the amount of water but takes the same range of time in the chart. To saute, bake and roast, you need to care about the heat on the stove. Baking vegetables in the oven set of 350 F, while roasting needs higher temp at 425 F. But they all take the same amount of time cook. 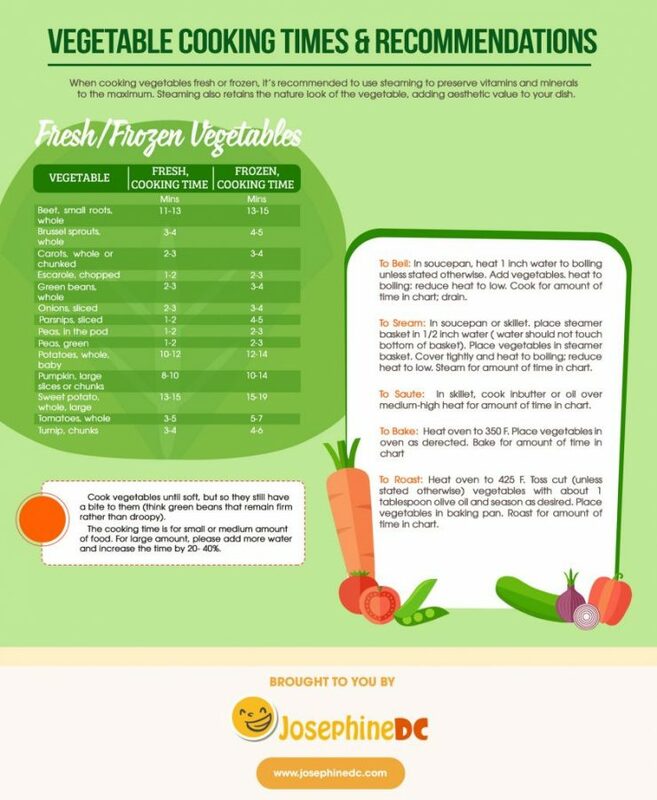 There are even tips to have the veggies aligned correctly. Find them all the cheat sheet. Cooking recipes come from around the world, along with their standard measuring methods in the descriptions. When one recipe says you need to use a specific utensil to evaluate the ingredient in a standard you don’t know. What would you do? Pin this cheat sheet on your cabinet and simply compare them to the instruction. There is an abbreviation chart stating the letters stand for measuring value. G is Grams, OZ is ounces, FL OZ stands of Fluid ounce, LB is pound, TSP is teaspoon and tablespoon is TBSP. There will be no more confusion. 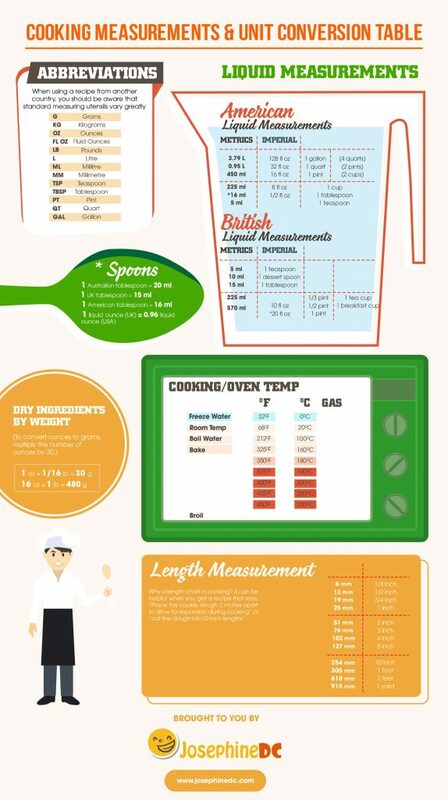 If you have been messing around between grams and ounces, litters and gallons, or F degree and C degree, this kitchen cheat sheet of Cooking Measurements Conversions will free up your memory from remembering the numbers. The chart converts common metrics so you don’t have to pull out the calculator. For example, a can of 450 mL is 16 units of FL OZ equals 1 pint or 2 cups. In the British standard, 5 mL equals to one tablespoon, or 10 mL is converted to 1 dessert spoon. Your cooking process has never been easier. The conversion chart is especially useful for bakers who spend most of their kitchen times with dough and measuring. The charts include converted values of temperature for the oven and stove as well as length measurement from millimeter to inch. The common temp of the room, boil water or your freezer is indicated clearly. Especially for baking, all the ideal values are here. Everything will become faster. Interestingly, this infographic also instructs to scale from tablespoon of regional standards from the UK, Australian, American to milliliter. You can as well scale the dry ingredients by multiply the ounces by 30. You are normally not concerned about how and which part of the meat to serve for your own meal, but what if you have a barbeque party to throw? The kitchen cheat sheet of meat cuts will save your life from this irritation. The greatest part of this sheet is it lists out every single part of meat on pork, beef, lamb, chick and fish. In other words, except you look to serve octopus or scallop, the infographic has an appreciated info structure. In particular, the sheet emphasizes the appropriate cooking style for each part. For example with pork, the rib chop is ideal for grilling, pan sear and braise while the blade-end roast has only one recommendation. The suggestions go on with other pastures and poultries. You get a map of parts on each animal so that you can identify which one is juicier, tender or less chewy. For the beef, you will know that the chuck and blades will be perfect if you make stew, raise or roast them in a pot. There are such parts that only suitable for one type of cooking like the fore shank tongue. Beef organs can be delicious but you should not grill them but bake, simmer, or stir-fry for the best taste. Lambs have less division than that on the cow. People who enjoy lamb BBQ should pick the dice, gigot chops, leg steaks, rump, or striploin. Chicken is always among the popular choices; that’s why its meat parts have more ways to cook with. For the whole chicken, there is nothing better than roasting. The other options for wings, legs and breast can go to braise, grill, stew, pan-fry, deep-fry and things that you can do on the stove and oven. The organs are a bit different as they are all best in the pan-fry. With the fish, you will see how people distinguish them into fillets and steak. Big fish and whole fish are both delicious when baking in foil. But if you prefer deep fry, don’t pick the big ones or they won’t fit your pan. The little guide will surely help you to pick the best recipes for each type of meat, thus serve the best party ever. A kitchen cheat sheet benefits its users in so many ways in the cooking area. You will never have to google every information strenuously when you need them. With these infographics, you can print them out, stick them to your cupboard and fridge, or hang them around where you can easily look at. You will have excellent reminders around and cook with more convenience. If you don't like to have them hung, save the picture in your tablet or smart devices where you can easily access. Cooking has never been more enjoyable.